Thanks to readers and others who commented on our draft points for cycling routes for all ages and abilities — below is our response to comments. If you have not commented already, we still are welcoming feedback on that page or in the comments section at the bottom of this page. REPLY: A buffer for door zones is now added. REPLY: These are important issues and, as part of a seprate project in the future, IrishCycle.com will looking to highlight the lack of high-qualty bicycle parking at supermarkets and shopping centres. However, as inpetto62 said in the comments section of the draft, bicycle parking requires its own strategy. Dutch-style segregation removes bicycle flows from many traffic lights at a far higher and wider level on main roads and streets, while on more local roads traffic reduction eventually leads to the removal of traffic lights. REPLY: This is not directly related to cycle routes. REPLY: Dutch cycling blogger BicycleDutch starts his post on liability by saying “It is a myth that is really only believed outside the Netherlands” — it’s worth reading his post. REPLY: Maintenance added under continuity and quality and under permeability. “Priority. Riders should have at least the same priority as cars going invite same direction not be relegated to third spot. REPLY: We’ve beefed up the section “priority at junctions and across side roads” to make this clearer. REPLY: This isn’t the case currently. All road users, including pedestrians, have a legal obligation not to injure themselves or others. REPLY: “Generally” was included because painted cycle lanes are desirable in some locations (ie contra-flow on low volume streets). But we get your point and will look at rewording to make it clearer. REPLY: Mainly by email and other digital means, while we know some may sign up with our contact, others will need convincing and, for many, contact directly from their constituents will likely be more effective than contact from this website. My first comment: The statements / needs defined in this draft are more than just cycling issues. To make cycling in Irish cities and towns one need more than just cycling infrastructure strategy and cycling manuals. The key issue is to refrain from car dominance, give public space back to cyclists and pedestrians, walking, sitting, stroking, etc. In order to do so an integrated policy approach is necessary. Many of the phrases in this draft relate to reorganize motorized traffic circulation in larger areas by limiting the motorized traffic routes, including physically measures to limit car speed in houses areas, near schools, shopping areas, play grounds, etc. Around the year 2000 Dublin City Council has studied on so-called Environmental Traffic Cells, based on traffic calming and making traffic more democratic for all road users. Traffic calming is one of the most successful and economic-feasible (cost-effective) cycling measures a city council can take. Retrofitting kilometers of segregated cycling paths is complicated and costly. Please do not get me wrong. Cyclists need all (!) infrastructure cycling measures which in are in the toolbox (and in the National Cycle Manual), however the first thing is to reflect and decide on the function of any road / street. One of the key factors of safe and direct cycling in The Netherlands back in the ’70/’80 (where the long urban space restoring process started) was the obligation of the Dutch Ministry for all regional and local governments is to have a serious integrated traffic circulation plan for the whole built-up area, as a CONDITION to gain any Dutch guilder (Hfl) as subvention money from the Minister. This has brought wide awareness of the needs for cycling networks and pedestrians areas / routes / squares. So the first effective urban cycling plans were traffic circulation plans. With a well-balanced strategy document for traffic circulation one can better derive cycling network plans for the whole urban area or for parts / new areas / rehabilitation areas and use them as serious INPUT for development plans and guarantee permeability from the very start. The greening of the public space should be supportive for cycling and walking routes. The so-called Integrated Framework Plan, developed by DTO (now NTA) for New Towns as Blanchardstown and Balbriggan developed around 2000 tended to become a strong planning instrument to take strategic decisions and make effective linking between top-down (documents) and bottom-up (designs), vice versa. I am curious what their legal meaning is nowadays. Cycling network planning was certainly meant to be part of that instrument. REPLY: We strongly agree with the idea that traffic circulation planning should come before building cycling infrastructure. However, our draft points are a reaction to on-going cycling infrastructure design and construction of a lower than suitable standard. We have added a point on traffic circulation plans under our ‘permeability’ header, but will look at possibly upgrading this to it’s own header or as part of a overview header. Re Blanchardstown, while some of the planning in this area was better than average, permeability remains lacking and the cycle network is disjointed and suffers from poor design, including a lack priority at side roads, shared surfaces often split into narrow width and poor junction design — ie the kind of detailed issues the draft is trying to address. REPLY: Agreed, points on maintenance added. If there’s other suggestions around maintenance we’ll look at adding points. REPLY: Agreed, we hope the draft points already reflects this. REPLY: Zero cyclist deaths is likely a more suitable as a goal in a road safety strategy rather than a point to alter design / planning manuals with. REPLY: Agreed — a signage point is now added to the section on contra-flow. REPLY: Agreed with your overall point, and many of the designs and principals outlined in the draft keep people moving or means they are less likely to have to come to a full stop. REPLY: Overall, we don’t put Amsterdam down as having even near ideal cycle networks compared to some of the most cycling freely Dutch cities. In Amsterdam and, more so, other Dutch cities, one of the goals of the cycle networks is to keep bicycles moving as much as possible — so you get priority at side roads, cycling priority roundabouts, bypasses of traffic lights turning right (our left) as standard on main routes, traffic light bypasses of the top of T-junctions, grade-segregated bypasses of large junctions and roads, and they are building a new network of fast inter-urban cycle routes. 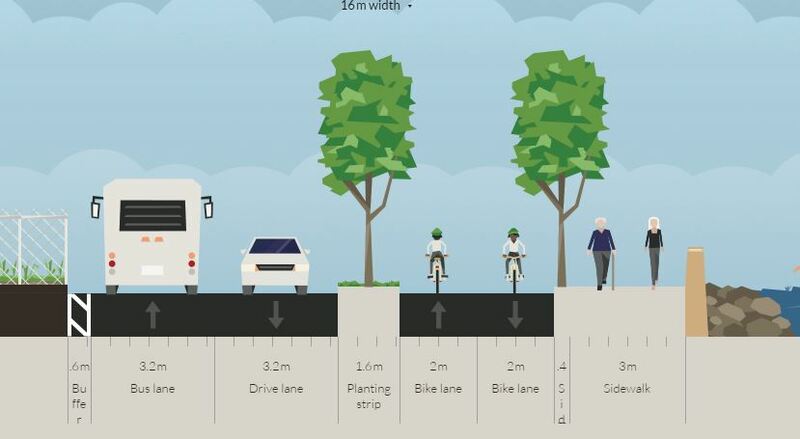 To reenforce the above the draft will be updated to include any of the above not yet mentioned and include faster cycling and electric bicycles as users which routes need to be designed for. REPLY: We are trying to get both councillors and TDs to sign up to the draft principals with a goal of improving cycling a network standards from different levels. We need, however, to back up what those principals amount to. It is no more minutiae of cycling infra design, than insulation standards is minutiae detail of housing design — at least two councils have agreed to Passive House standards. And at national level TDs deal with minutiae details of complex legislation. Re “Even pro-cycling engineers have different opinions on what should be provided” — part of this process is aiming to enable people to constructively demand that politicians get behind better cycle network standards, and basically to follow the Netherlands rather than carry on with our current mix match of standards and generally poor outcomes. We see space and standards as — currently at least — policy issues and elected members, not engineers, should be responsible for standards. Where infrastructure is provided, the first priority should be the allocation of road space, followed by minor junctions, signalised junctions and then ‘other’ junctions. We should be able to argue for re-allocation of road space and minor junctions. Many schemes do make best use of space already but many others do not. The problem is lane width but I think that this can be changed. There are also a number of examples around Dublin of the right way to deal with minor junctions. At the same time there are many examples of new jobs where footpaths and cycle tracks stop abruptly at private entrances rather than being carried through. If we get the reallocation of road space and priority of minor junctions sorted, we can look at protected signalised junctions and ‘other’ junctions. We need to engage with politicians local and national. There are people who are pro cycling and other who are anti-cycling in all parties. The political parties or groupings support cycling but it is soft support so we need to try and firm this up with cross-party support. REPLY: Re space, yes, agreed. 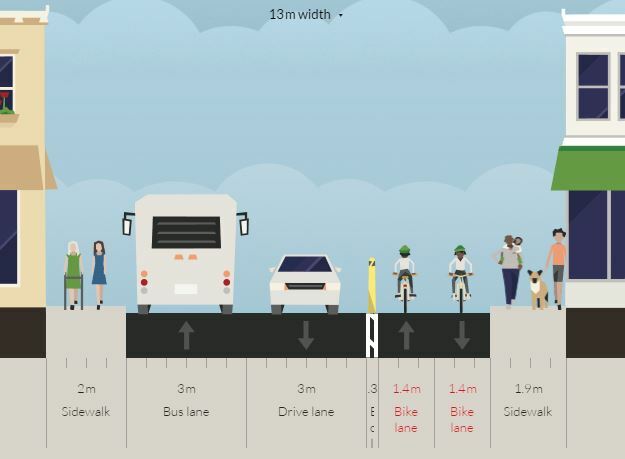 The outlined draft principals and standards will require a reallocation of road space and this is also made clear in the design manuals which we want amended. Re engagement: yes, we also agree on that point and it has to be central to this process. I think that the starting point is government targets. We need to either use that target locally or establish new (lesser) lower targets. We also need agree a consistent indicator for modal split – one that is relatively cheap and easy to calculate at a micro level as well as nationally. I liked the idea of the tour of Belfast which NI Greenways described in his blog. It was a tour of the lowlights not the highlights. We need to bring non-cycling councillors out and show them the shortcomings. One problem is the lack of good design – by which I mean design which encourages or invites mass cycling. A big bang would be good but I see change as being more gradual rather than revolutionary. The outcome of the Smarter Travel Areas is disappointing – an increase of approx 0.2% in cycling per year. At this rate it will be decades before we make any real progress.One of the thing about the STAs was that they were supposed to be innovative but I haven’t heard of any innovation coming out of them. In fact the reverse – they shied away from reallocation of road space. Cycle forums are critical as they are where cycle advocates interface with politicians. These are my initial thoughts on the article. REPLY: Re the smarter travel areas: I plan to write about these further, possible after another visit to Westport. Re a cycling tour: I’m possibly going to plan something along this line: it will in be in Dublin first anyway and would likely cover a critical look at projects of different levels of quality. 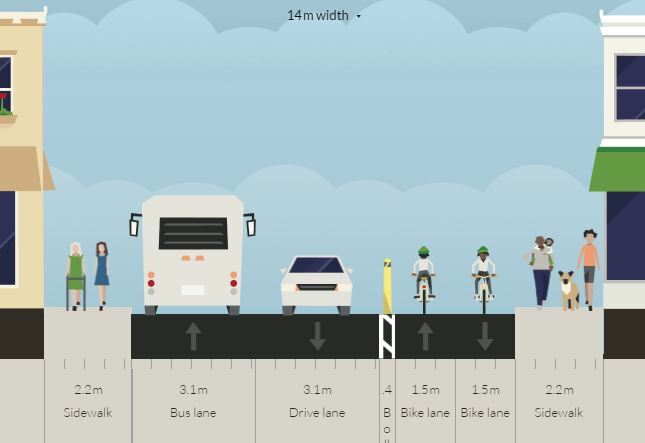 (1) From the train station to Water Street: There’s two options to fit in the cycle path: (a) remove one of the two car parking lanes, or (b) remove one of two one-way general traffic lanes and the usually realigning lanes and paths. Again: I think the general width of this section is closer to 14m, but, even at 13m, the footpaths are within national guidelines; the two-way cycle path is slightly above the measure for basic two-way in National Cycle Manual, and the driving lanes are wide enough for large buses or trucks to pass each other — with a low-speed environment forced due to the width. From there I’d suggest that it go onto Little Island via a continuous two-way cycle path along the south side of the train tracks with CPO used as needed. REPLY: Such an approach does not make cycling attractive to all ages and abilities, so it does not fit in with what we are doing here. REPLY: First, it’s worth saying that this isn’t just about looking for segregation, but a number of linked infrastructure changes which together create a cycling network suitable for all ages and abilities. Dutch experts point out that their research points to the importance of having cycle networks (single or unconnected routes are of limited use for people unwilling to brave mixing it with high volumes or speeds of traffic). Nevertheless, there is a also growing amount of data and accounts from around the world that segregation works to increase use, and survey after survey shows there’s demand/preference and public support for segregation. From a moral and safety perspective, increasing the level of cycling without also increasing safety using good infrastructure is questionable. While more traffic cops are likely on their way with increasing Garda numbers, this can only have so much of an effect as you can’t have a police man or woman on every corner. 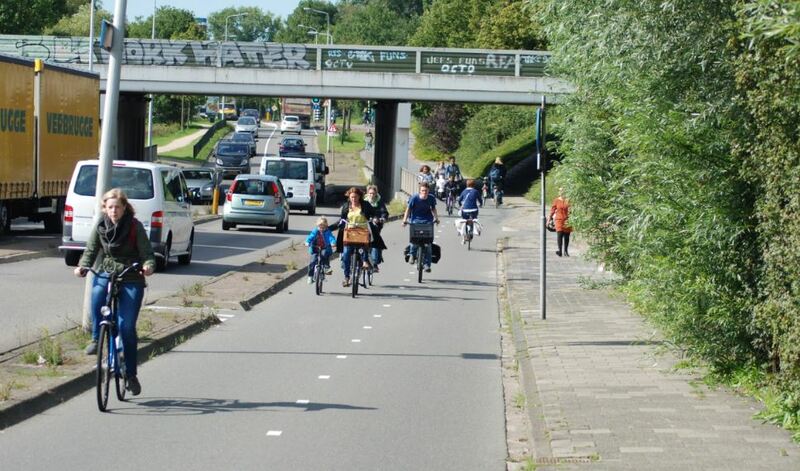 We’re often told it’s down to different cultures, but we think the answer to the following is same for 90% of Dutch and Irish parents: Would you allow your child to cycle a busy road like this without the segregated cycle path? Re the tour part, It should be mandatory for the chartered engineer who signs off on the design to cycle any new cycle infrastructure at opening, and just before to snag it. So we have a named person accountable for any poor design. That’s fair enough, it’s wider than I remembered, the 3 storey buildings make it feel narrower. It’s sometimes very hard to see beyond current use of any space, and that’s very much so true for roads and streets. It can be very surprising what narrowing lanes or moving things around can do — often without having to remove traffic lanes. With the pinchpoint area mentioned above the general traffic lanes are wide to start with and you also have around 1 metre in the middle wasted as a painted buffer between the lanes. I was interisted in measuring out and mapping out a route given the recent debate re travel to Little Island. It would have been ideal if the Jack Lynch tunnel could have accommodated cycling in the access / emergency tunnel.